Work and career are aspects of my life that I enjoy and take pride in. However, I have always struggled to find a satisfying balance of work, family, and my need to create, to be an artist. I won’t go into the long story of how hard this has been. Let’s just say blocking out time on my calendar to make art is guaranteed to result in everyone else in my family being home sick with the flu on the long awaited day (like last Wednesday) or the worst ice-storm in decades shutting down the entire city (like today). Ever since my daughter was born, for the last 13 years of my life, this struggle to find non-negotiable time for solitude and creativity has been a problem I have never resolved. I have tried various approaches. And have come to learn that there is no easy or clear-cut solution and there never will be. This conflict between my need for creative solitude and my need for relationship and meaningful work will always exist. I can’t sit around waiting for a more peaceful existence, with less to do and people who want nothing from me than that I go into a spacious studio and make art. Instead I have to be determined and tenacious and make my creative life a priority that I commit to in whatever imperfect way is possible, every week. Last fall, after a year of spiritual discernment in preparation for becoming an Associate with the Sisters of Providence, I wrote the following commitment statement: I will protect at least 3 hours/week for playful creative expression in order to open to divine inspiration and experience Providence as a generous collaborative partner. I will explore artistic play as a sacred process and as prayer which deepens and restores my relationship to self, others, world and Providence. And I reorganized my life so that, every Wednesday, I have at least 3 hours while everyone else is away at work and school. And as soon as Christmas vacation ended, I began doodling, sketching, experimenting, scribbling, showing up for my creative play dates! The first Wednesday, I was feeling a bit under the weather, but I began and soon felt so grateful the stars had aligned and a beginning had been at last been made. The next Wednesday, I picked up where I left off, getting not quite 3 hours in before taking my daughter to a dentist appointment, and doing another hour later in the week. Then next Wednesday, I was physically exhausted, but again showed up, with no expectations or demands of my time other than that I play with the art materials. I have been doing my best to observe my process, to not demand finished products too soon, to see what imagination and play will lead to if I got out of the way and let things unfold. And despite recurring judgements that what I am doing is silly and worthless, I was beginning to feel some momentum and a feeling of hope. I was looking forward to what the next week would bring. And then the flu hit, and the ice storm. During flu week, I managed to make a sketch I really want to continue with later. I’d hoped to play with it today, but since we are all housebound in a suburban igloo today, I have decided instead to write this blog post. I want and need to chronicle my creative efforts. And to share some of my reflections with others in this blog because I am sure there are other working-parent-artists out there like me searching for their own determination and tenacity to stay creative. As an artist, I need to create a body of play. I have plenty of work in my life. Even the thought of making a body of work shuts me down. My sketches and doodles are most frequently of dancing woman, moving women, big, active, sensual women. They surprise me. A long time ago, I imagined myself making soft, peaceful, impressionist landscapes. But I remember my mother looking at my elementary school drawings and saying that I did movement well. I like to move. Movement is part of play. I often feel crowded out by all the other demands of my life. No only do I need to make a visual body of play, I need to live in a body that is playful. I like to stand up when I draw. I want to work on large paper. The dance is ever changing. There will be more time to create soon! Yes, soon! 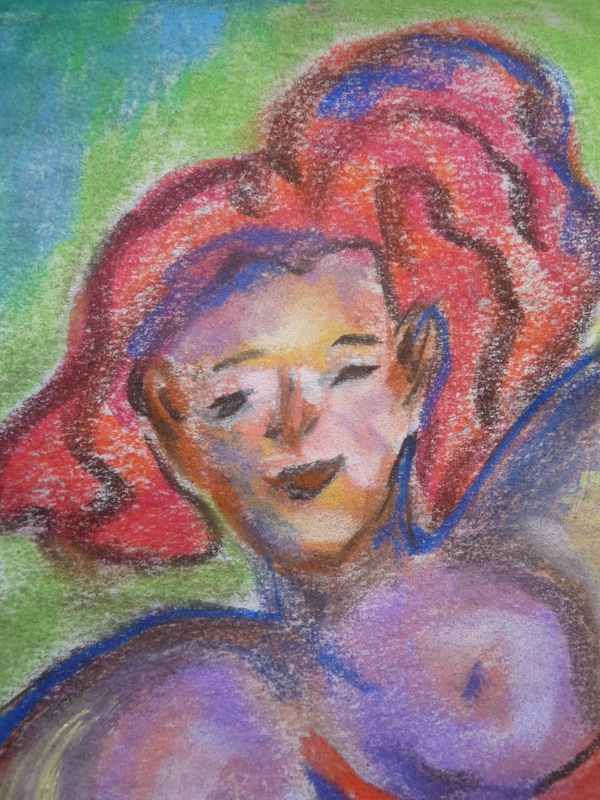 You are currently browsing the Expressive Art Therapy and Dreamwork with Liza Hyatt weblog archives for February 2011.